The iPhone 5 is a beautifully designed and very lightweight phone that a lot of users don’t won’t to spoil by adding heavy cases to in an effort to protect them from normal everyday usage. 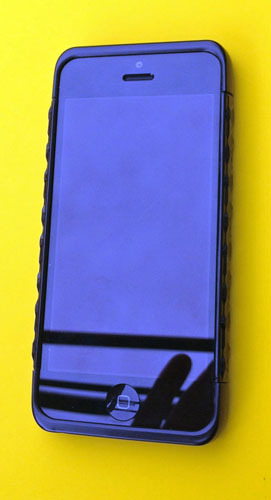 Enter Marware’s rEVOLUTION case for the iPhone 5. Designed as a three-piece system, the rEVOLUTION is made from Polycarbonate material that provides a durable shell around the iPhone. The material is very lightweight but provides the proper amount of protection to the back and sides of the phone without being overbearing. Marware even provides the user with a screen protector for the iPhone if one so chooses to install it on the phone. I decided not to place the protector on my phone and went without it. The installation of the case is simple; slide the top and bottom sections of the case on your iPhone and then position the middle piece with one side on one edge of the iPhone and then snap the other side into position. I can tell you that the three pieces fit snugly together and do not come apart unless you so desire to remove the case off of the iPhone. The access points for camera, headphones, mute switch, lightning cable and speaker are there and the volume control and on/off buttons are covered by the case without any loss of control what so ever. The entire front of the iPhone is totally clear of any obstructions and access to the home button, camera and earphone is not hindered in any way. The instructions that are included for the installation or removal of the case are clear and concise. I will tell you that in using the case it does not add any perceptible weight to the iPhone and that when it was in my pocket there were times that I found myself checking to make sure that the phone was there as I just didn’t feel it. 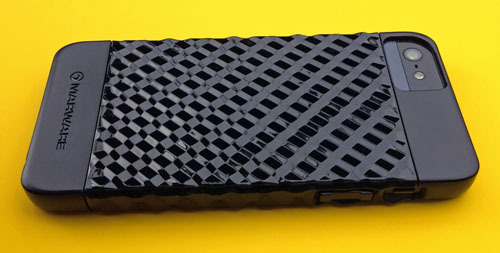 The sleek overall design of the carbon fiber case provides good control of the phone and the ridge design on the backside keeps the phone in one place. The case itself only weighs in at 1.6 ounces so one does not feel as though the iPhone itself is weighted down. 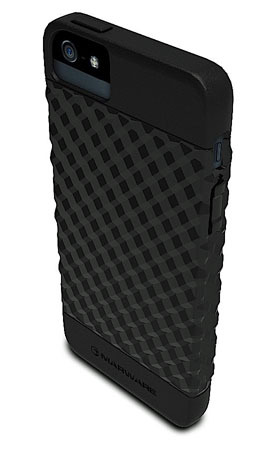 Marware offers the case in the Black carbon fiber appearance as well as a White Sea and a Silver brushed metal design. All of the cases come with a one-year warranty. So if you are looking to provide protection for your iPhone 5 without encasing it in an overbearing case that takes away from the sleekness of the phone’s design, you should really consider Marware’s rEVOLUTION case. In doing a quick search, I did find that the case is available at lower pricing than the manufacturers suggested retail price, so look around first. All in all, I give Marware’s rEVOLUTION case for the iPhone 5 a My Mac rating of 8 out of 10.